he American system of government was founded upon the firm belief that individual freedom is a basic right. But hand-in-hand with this was an equally strong belief in personal responsibility. The founding fathers embraced that responsibility, knowing that placing their signatures on the Declaration of Independence could unleash dire consequences, even death. For the promise of greater freedom and independence, they committed themselves to inspiring, financing and directing a perilous struggle, the harshness and duration of which few envisioned. From that struggle came the freedoms we cherish today, including freedom of religion, speech, press. Never in the history of mankind had such sweeping powers been won for the individual, and never before had so many people enjoyed such a degree of personal freedom. In todays age of electronic information, the traditional social and legal interpretations and parameters of freedom and responsibility are undergoing serious test. In stark contrast to yesterdays bold signers of the Constitution are modern-day anonymous users on the information superhighway who seek license without responsibility and accountability, and therein endanger the hard-won freedoms of all by inviting regulation. 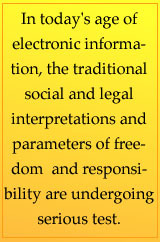 In this issue of Freedom, we address these significant matters of on-line life in the 1990s, and call for application of the highest ethical and legal standards in cyberspace. We have put the spotlight on a small but insidious group who shroud themselves in secrecy to exploit the medium  the minority who violate the law by various means, including outright theft, libel and defamation  and show how this places the freedoms of others in jeopardy. Throughout its history, Freedom has actively used the Freedom of Information Act, educated others about the importance of exercising this right, and extensively covered freedom of information news and trends. We have filed hundreds of requests under the FOIA to many different government entities, and gained the release of tens of thousands of pages of documents. Also in this edition, we bring our readers up to date on the present state of the Freedom of Information Act, including how it relates to electronic information and what it has to do with todays on-line life. Over the last two centuries, the evolution and expansion of freedom in America constitutes one of the greatest stories in the history of mankind. The challenge is to achieve a comparable level of personal responsibility.